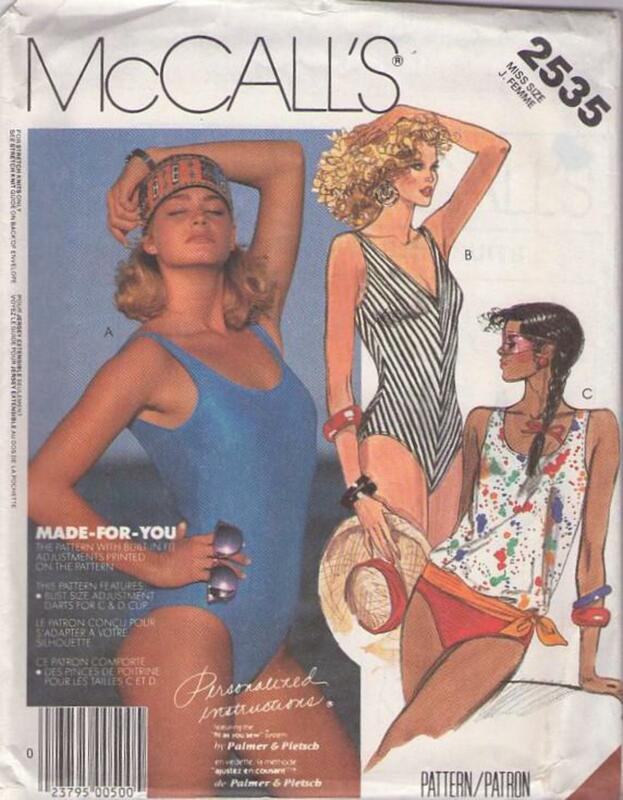 1986, 80s Summer, Retro Beach & Pool Party Clothing Patterns - MISSES' SWIMSUITS - FOR TWO-WAY STRETCH KNITS ONLY: Swimsuit A has scoop front neckline and low cut scoop back, lining options and cutting lines for high or low-cut legs. Bias cut B, with lining options, has V-neckline and low-cut scoop back. C has front and back scoop neckline (upper swimsuit suitable for stripes), bra lining, contrast lined lower swimsuit and optional contrast sash. A, B or C has elasticized edges. NOTE: This pattern features bust adjustments on view A and C.